After breakfast, the bloggers in attendance were gifted with a shopping spree at Lord & Taylor before the store opened to the public. (Insert Choir of Angels sound here). Being able to shop before the store even opened gave us the opportunity to really see styles we might have missed in the crowds, and I got the chance to interact with some amazing folks including the visual merchandiser for Guess who happened to be stocking when I walked over to the Guess Section! I probably spent WAY too much time checking out shoes and handbags which will always be my weakness! As many of you already know I have dropped 26 pounds this year so far, and was pleasantly surprised to find that many of the stuff in the womens section was actually too big! YAY! I was super stoked to experience the REVERSE problem, usually stuff is too small, but today a ton of way 'too bigs' had me leaving the store floating on a confidence high. And of course as with everywhere I go, there was a butterfly sighting, I spotted quite a lovely butterfly necklace with a swarovski crystal that did catch my eye. 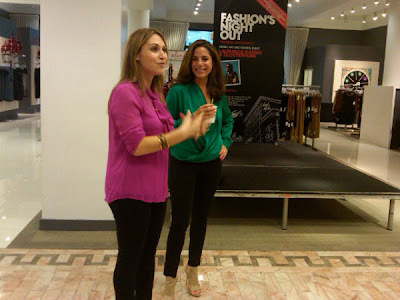 I can't think of a better way to have started Fashion Night Out! I certainly hope Lord & Taylor was on your agenda! And now, tell me all about your Fashion Night Out experiences. Where did you go? Which shows did YOU see? FTC Disclosure Info: A Gift Card to shop at Lord & Taylor was provided to bloggers in attendance, however, no monetary compensation has been received and I was no under no obligation to post and all experiences and opinions regarding the blogger breakfast are my own.